These Flag Signs Are An Effective Way to Communicate Simple Message to Visitors. Choose from Several Sizes and Styles In This Online Catalog. Buy Wholesale Flag Signs Today! 5.75" x 6" 8.5" x 11"
Front-loading frame with a suction cup included for quick and easy graphic changes. 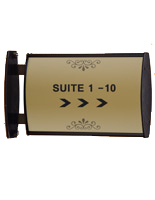 Holds (2) 8-1/2" x 5-1/2" inserts back-to-back to ensure messages are readable from all angles. Mounts to ceiling in portrait orientation, mounts to wall in landscape format. 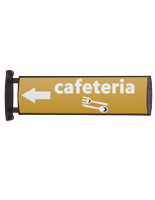 These flag signs are an affordable way to display and communicate simple messages. The wayfinding system like the one seen in here, can be used to display occupants names, directional arrows, room numbers and warning signage. 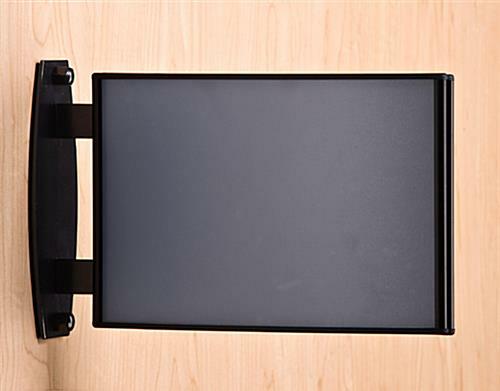 These flag signs, also known as wall displays, are constructed from durable aluminum with a sleek black finish. 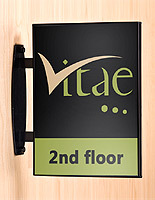 The office signage system can be used in any commercial environment. These office wall systems, black flag signs are also two-sided and feature non-glare lenses to protect the message. 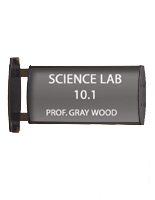 Users can show 8-1/2" x 5-1/2" sign on each side. These flag signs that are double-sided can be mounted vertically or horizontally to any flat surfaces. 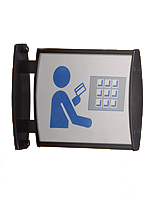 These wayfindings and directories are a great way to direct visitors or new employees to their way. Therefore, these flag signs that are for indoor use are widely used in many large public areas like libraries, schools, courthouses and government centers. Some large firms also use the wall signage frame to distinguish room numbers or occupant's title to avoid confusion especially for new employees or visitors. These flag signs that have a curved design make signage stand out from the frame no matter where they are placed. This product does not come with any graphic. 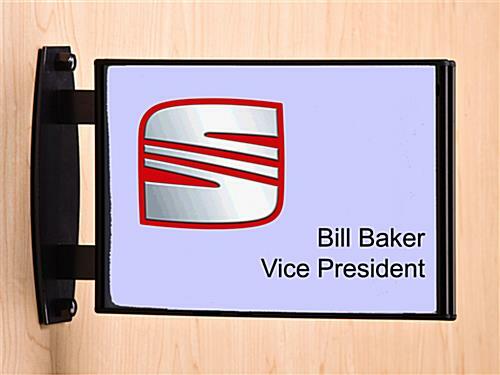 These wall-mount flag signs, like office signage displays, allow users to custom made their own artwork. Your graphics can be printed right off a regular printer, so that users do not have to purposely go to a print shop to get it done. These office signage displays, flag signs come with a suction cup. 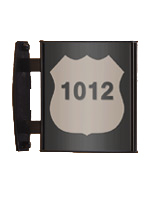 Graphics changes are relatively fast and easy with these room number frames. Users can use the suction cup to lift-up the plastic overlay and place the sign behind the lens. 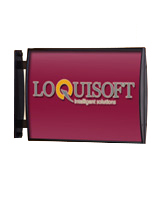 This office signage displays are sold in other sizes as well. 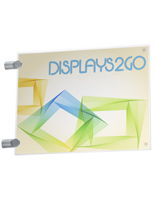 Purchase these wall directory frames online to get more savings. 9.9" x 6.4" x 20.0"